In the living room, built-in custom shelving displays pottery and a large collection of paperbacks. The couple added soft washes of yellow paint to the walls to make their house feel cozy and warm. David Mosely and Andy Masland, with their springer spaniel, Luke, have made a home in Highland Green, a 55-plus community in Topsham. They were enticed by the friendly neighbors and the acres of conservation land. 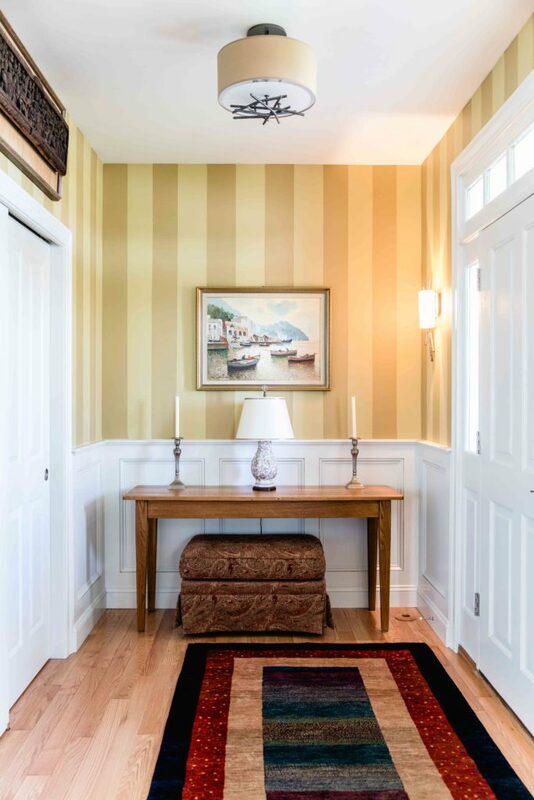 The light fixture in the entrance hallway is by Hubbardton Forge. 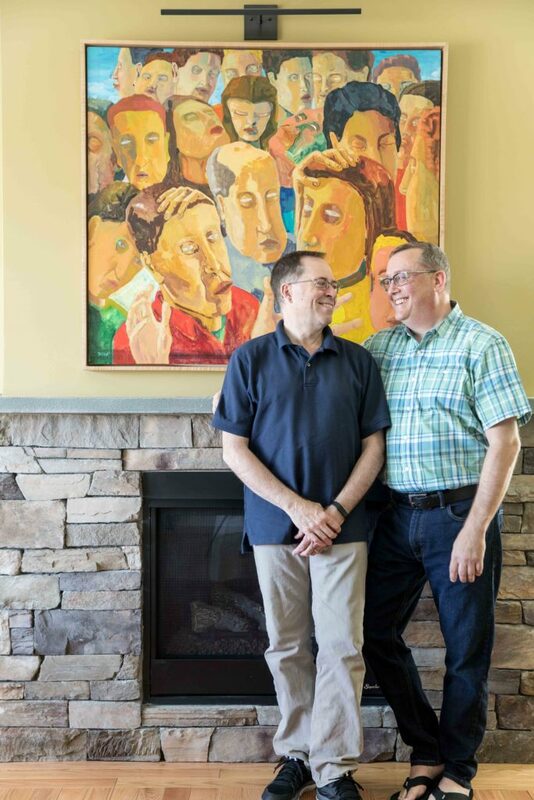 Andy, left, and David decided to make this statement piece of art the focus of their living room. The couple supplemented their existing furniture collection with pieces from Country Farm furniture in Bath. The couple and Luke relax on the enclosed porch, which has a heated floor and a view of the woods. Highland Green helps future residents design their perfect home based on a series of templates. 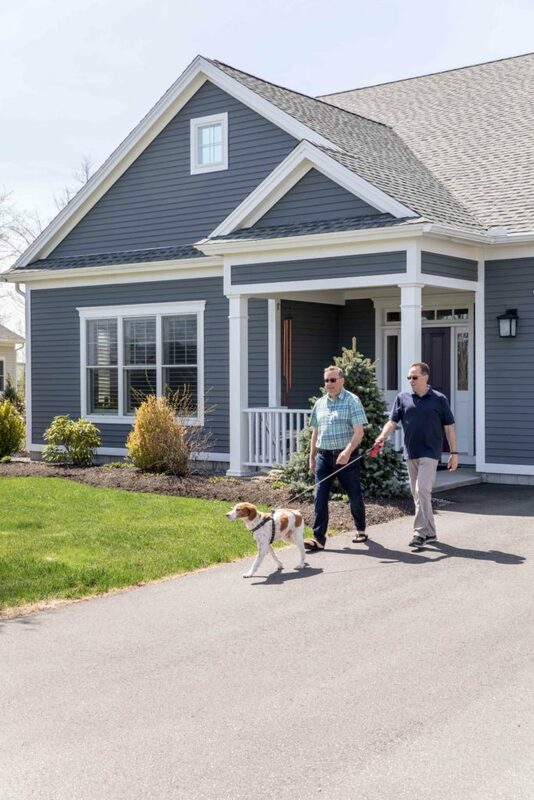 A well-traveled couple finds a way to live large while downsizing in the vibrant community of Highland Green. Initially, David Mosley only visited Highland Green to rule it out. He had heard about the 55-plus community and his first impression was a strong one. “We used to play Topsham in high school sports,” says the Norway native. 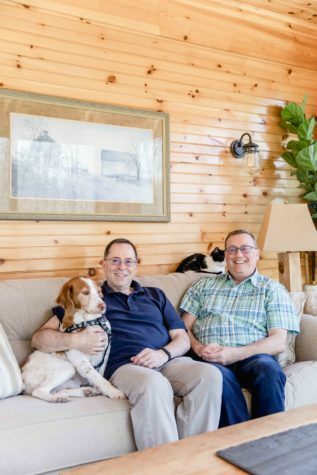 “Why would I ever want to live there?” He and his husband, Andy Masland, were seeking a place to relocate. The couple had traveled all over the world, and as they readied themselves for the next stage of life, they thought about all the possibilities available to them. They could move to Tahoe, where Mosley once lived, or Seattle, where the couple first met. They could live in Massachusetts, New York, California—or what about Japan? (“We did think we would probably end up in Portland,” Masland says.) 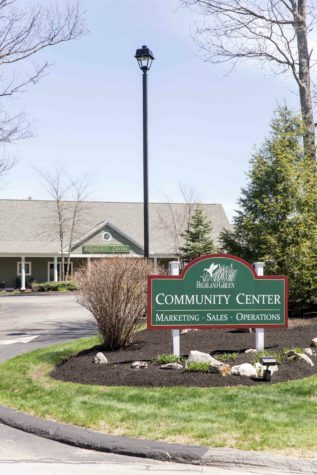 So moving his life back to Topsham was the last thing on Mosley’s mind as he steered his car off route 196 and onto the hilly suburban roads of Highland Green. The porch, Masland reveals, was his idea (though both men do enjoy the indoor–outdoor space). “We decided to each pick one thing we really wanted,” explains Mosley, “And I wanted that kitchen.” He leads me inside and I spend a moment touching the custom-made cherry cabinets, made by Home Again of South Portland. The red undertones of this smooth-grained hardwood wood echo throughout the open-concept living space. “We picked cherry to match a lot of our furniture,” Mosley says. 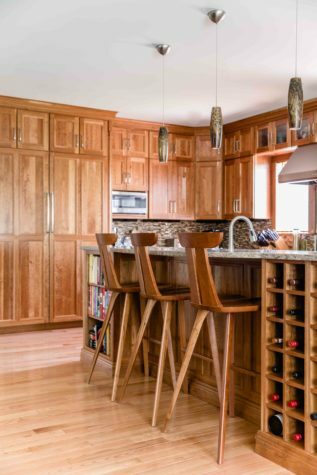 While Masland was involved in choosing the finishes and furnishings, Mosley narrowed down the seemingly infinite number of choices available and presented his husband with three options for each element, from countertops to cabinets, appliances to tiles. They worked quickly and created the design for their elegant kitchen in a single day. “I didn’t want any pulls,” Mosley says, “because of my arthritis. I wanted to keep everything clean and simple— and simple to clean.” He selected quartz countertops, stainless steel handles for the cabinets, rust-colored tile backsplash for behind the sink, and a professional grade Thermador stove with six burners and a stainless steel backsplash. “We also wanted two dishwashers to make clean up easy after family gatherings,” Mosley says. hasn’t retired yet, so a private study was a must for him. (He works for a Japanese technology company and still takes frequent trips to Japan. Mosley works at a library part-time—a natural fit for the former bookseller.) 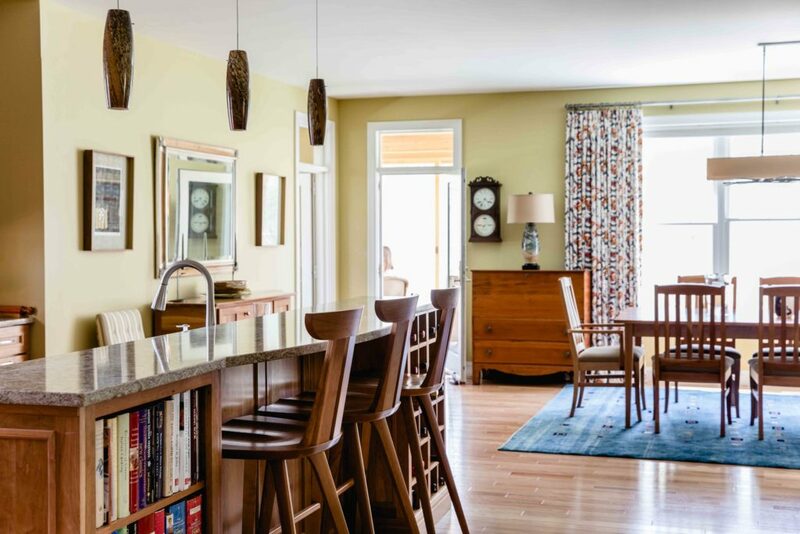 These pieces play nicely with the large dining room table—big enough to seat ten people—purchased at Country Farm Furniture in Bath, and the graceful, high-backed barstools that sidle up to the kitchen island. Since they designed their first-floor home with an open floor plan, it’s necessary that the kitchen, dining room, and living room furniture all work together. Thanks to their similar colors and unifying style, they do. Although their art collection is slightly more eclectic, the uncluttered walls and traditional textiles help to ground the space, letting each painting and drawing breathe. “Our art is an amalgamation of things we love,” says Mosley. “We have an oil painting that my dad gave my mom for her 40th birthday, and an oil painting that was David’s grandparents’,” adds Masland. “But we also have items we bought together.” They have prints from Tasmania, plates from Bratislava and Sicily, and watercolors from Kashmir. 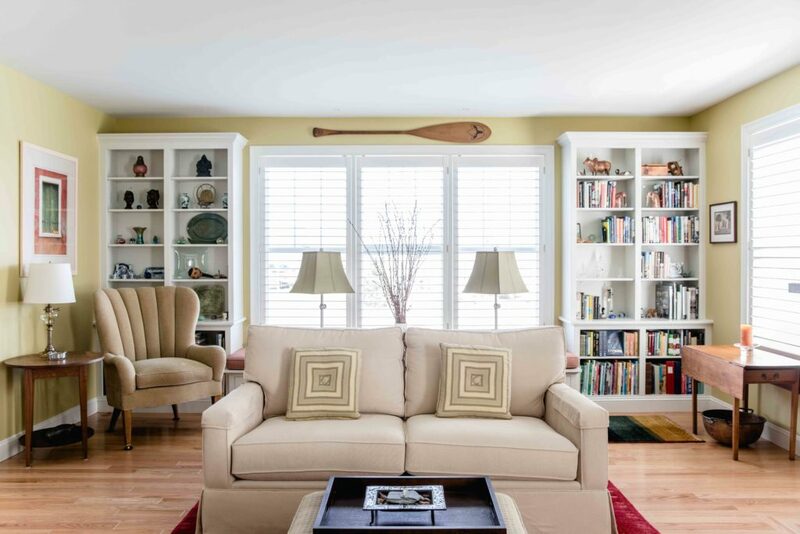 It’s clear that their new house is the product of years of thoughtful purchases; from the plush wool rugs from Araby Rugs in Falmouth to the watercolors from Japan, the space is a reflection of their lives’ journey. While the past is visible everywhere, they have also given quite a bit of thought to their future, too. Mosley and Masland plan to age in this home, and they have designed it accordingly. Early on in the process, they decided to invest in solar panels. They have 54 panels on the roof, which generate 95% of their power. “We looked at this as a cost we could fix in our retirement years,” explains Mosley. “We are paying ahead for our electricity. 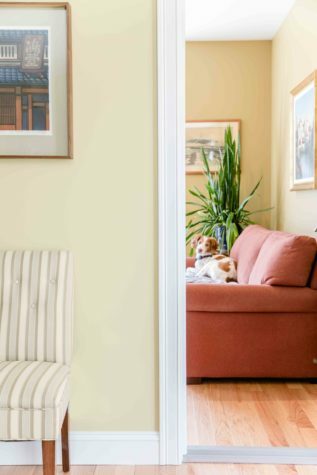 We saw this as part of our aging-in-place process.” Aging also played a role in smaller purchases, like the firm-cushioned living room sofa. “I wanted to always be able to get up from it easily,” laughs Mosley. 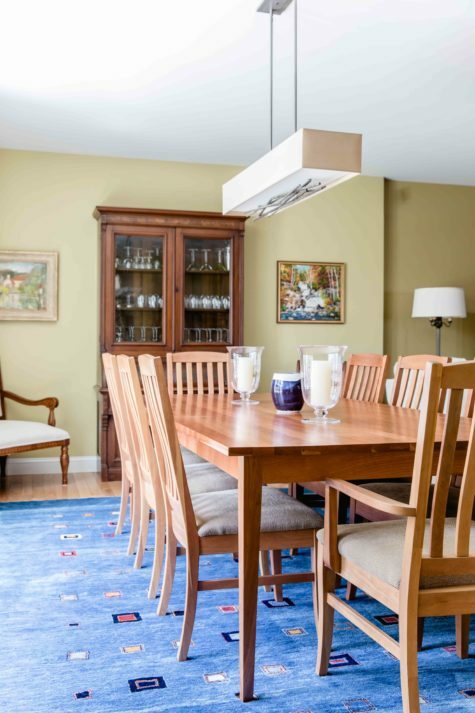 The dining room table is large enough to fit family and friends. 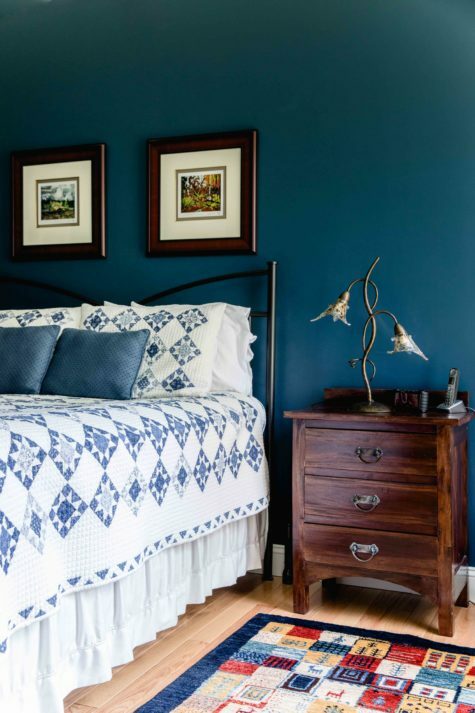 On the walls of the owners’ bedroom, Benjamin Moore’s Washington Blue paint creates a serene mood. 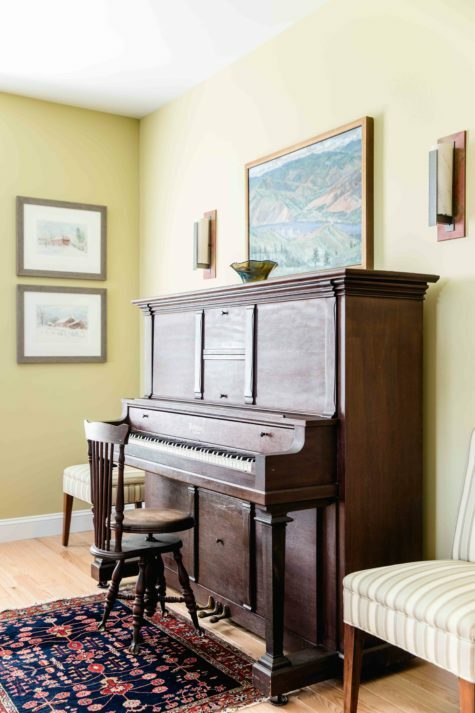 While their home at Highland Green has a smaller footprint than their previous home in New Hampshire, there is still plenty of space for treasured possessions, such as this player piano.